1.To get Selena Gomez's look, apply a volumizing mousse and heat protectant to damp hair, and blow dry with a round brush to add volume. 2. Use a medium barrel curling iron to curl random sections of your hair, giving it some texture. Spray with a flexible hold hairspray. 3. Take your fingers and glide them through your hair to pull it back into a loose mid-height ponytail. Use your fingers to pull the hair at your scalp forward to create height and volume. 4. Grab a small section of hair from your ponytail and wrap it around the base of the ponytail to hide the elastic. Secure with bobby pins. 5. Set with a flexible hold hairspray. 1. To get Cara Delevingne's hairstyle, apply a frizz-taming serum to damp hair and blow dry straight. 2. Once your hair is dry, mist a texturizing spray on your roots to create volume. Then, create a deep side part from your hairline to the back of your head. 3. Next, French braid the smaller section of hair. Start around your temple and continue directly backward, until you reach the ends. Secure with a clear elastic. 4. Lightly tease the rest of your hair using a teasing comb and finish with a flexible-hold hairspray. 1. To get Vanessa Hudgens' hairstyle, create a deep center part and mist a heat protecting spray onto to dry hair. 3. Use a round brush to rake through your waves and smooth them out. Then use a fine-toothed comb to tease the undersides of your hair for extra volume. 4. Mist a shine serum throughout you hair, avoiding the roots. 1. To get Jessica Alba's hairstyle, apply a volumizing mousse to damp hair and blow dry your roots using a round brush. Use a diffuser to create natural texture at your ends. 2. Create a deep center part then mist a heat protecting spray throughout your hair. 3. Using a styling wand, wrap sections of your hair away from your face. Make sure to hold sections wrapped for just a few seconds, then let loose. 4. Brush through your waves with a paddle brush to loosen them. 5. Finish with a spritz of workable hairspray. 1. To get Nicki Minaj's hairstyle, apply a volumizing mousse to damp hair and blow dry using a round brush for added volume. 2. Begin creating large, voluminous curls by using large hot rollers. Wrap 2-inch sections of your hair around the rollers and let them set for 30 minutes. 3. Remove the rollers individually, piecing apart each section as you go. Tease the section with a fine-toothed comb to create a textured, unkempt look. 4. Continue removing the rollers and teasing, then spray a shine serum over your hair for added gloss. 5. Finish by misting with a strong-hold hairspray. 1. To get Scarlett Johnasson's hairstyle, apply texturizing spray to day-old hair. 2. Back comb hair on the crown of the head and the sides by your face to create extra volume. 3. Gather your hair up into a loose bun, and pin it in the back of your head. 4. Use a comb to loosen strands on the top of the head, and add any extra volume if necessary. No hair should be hanging down around your face. 5. Mist your edgy style with a strong-hold hairspray to keep it in place all day or night. 1. To get Nicole Richie's hairstyle, comb hair into center part and apply anti-frizz serum. 2. As you blow dry your hair, use a large round brush to pull your hair straight down while curling the ends at the same time. 3. Apply texturizing balm or paste to ends for a piecy, edgy style. 4. Mist lightly with finishing spray for hold. 1. 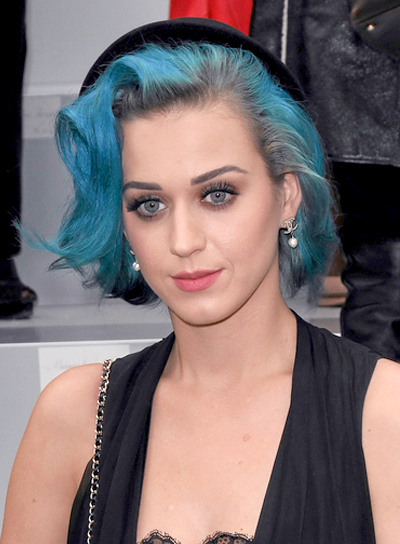 To get Katy Perry's hairstyle, apply a volumizing mousse to wet hair and part your hair on the side. 2. Blow dry your hair straight with a round brush. 3. Once your hair is dry, set it with large hot rollers. Make sure to roll the hair back and away from the face. 4. After the rollers have cooled, remove them, and spray entire head with a light-hold hairspray. 5. If you didn't get that signature curl at the top of your head with the rollers, go back and use a 2-inch curling iron to recreate it. Finish with more hairspray. 1. To get Selena Gomez's hairstyle, mist damp hair with texturizing spray and rough dry it for a messy feel. 2. To add more texture, wrap large pieces of hair around a 1 1/2-inch curling iron and comb through your waves. 3. Take the top section of hair and pin it back with bobby pins. Mist all over with lightweight hairspray to finish. 1. Don't wash your hair the night before -- this look won't hold on squeaky clean hair. 2. Use a 1-inch curling iron to curl the bottom half of your hair, twisting the barrel in different directions. 3. Sweep all of your hair back into a tousled updo, and secure it with bobby pins. Pull out a few curls here and there to add a quirky feel. 4. Now slip on a fun headband and curl a few pieces of hair around your face. Mist all over with strong-hold hairspray to finish. Heidi Klum's voluminous updo gives off a chic, rocker vibe. See how to get the look:1. This look works best on unwashed, day-old hair. Use a teasing comb to tease the top of your head, which will add volume to any limp strands. 2. Sweep all of your hair into a high updo. Make sure you leave room at the top of your head, and secure the bun with an elastic. 3. Spray your hair with tons of strong-hold hairspray, and use a comb to style it at the top. 4. Keep misting until it looks the way you want it, and smooth back the sides of your updo, pinning them back with bobby pins if they don't reach your elastic. 1. Part damp hair down the middle. Apply texturizing mousse to your hair and air dry to bring out its natural texture. 2. If your hair is naturally straight, wrap sections around a 2-inch curling iron to add wave to it. 3. Put some styling wax on your fingers and run them through your hair to make it look piece-y and tousled. Kristen Stewart's voluminous updo is a good choice for shorter hair. Steal her style:1. This look works best on unwashed hair. Rub texturizing mousse through dry hair and let it set. 2. Tease the very top of your hair and spritz it with strong-hold hairspray to keep the height at where you want it. 3. Keep a few wisps of hair out near your ear, and comb the rest of your hair into a high bun and secure it with an elastic. 1. Comb texturizing cream through hair and brush it up into a high ponytail. Secure it with an elastic. 2. Split your hair into two or three sections, and wrap each piece of hair around the base of your ponytail. Secure the ends down with bobby pins. 3. Mist your bun with strong-hold hairspray to make sure it stays in place. 4. Slip on a black headband if you want to add a classier vibe. Kristen Stewart's loose, flowy curls look so romantic on short or medium hair. Steal her style: 1. This look works best on unwashed hair. Rub texturizing cream through day-old hair and comb through well. 2. Use a 1-inch curling iron to curl your hair, and run your fingers through them so they're not too tight. 3. Use a teasing comb to tease the top of your head, and pin several sections of curls back while keeping the hair near your scalp loose.4. Mist generously with strong-hold hairspray to finish. Mena Suvari's bushy updo is a daring move, but if she can do it, so can you. See how to get the look:1. Use a teasing comb to backcomb all of your hair, section by section. Worried about damaging your hair? 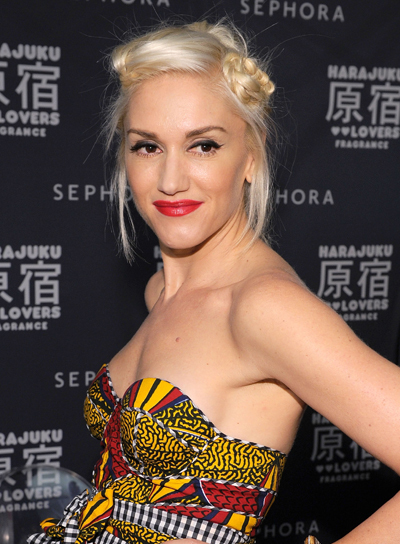 Buy an already-teased ponytail extension, tie your hair into a side bun and clip the pony on top. 2. Once your whole head is looking nice and bushy, sweep all of your hair on top of your head and pin each section down with bobby pins. Let the ends hang out over your ear and forehead.3. Mist the updo with hairspray and fluff it up with your fingers to bring out the volume.4. Finish the look by pinning a feather or glitzy accessory to the side of your head. Kristen Stewart's slicked back hairstyle will bring out the punk rocker in you. Steal her look: 1. Slightly tease the top of your hair, right above your forehead.2. Put some hair gel on a comb and use it to slick back the front of your hair. Don't comb straight back, but lift your hair up and then back for more volume. 3. Leave the bottom half of your hair alone, but run a bit of styling wax through your ends to separate them and bring out their natural texture.